Final Chance to Apply For Upcoming YLF, Employment Opportunity & More! Contribute to Our Newsletter NOW! NYC - APPLICATIONS ARE LIVE! Register for the FREE event! ATTENTION Parents/ Caregivers, this is for YOU! AMPLIFY-NY Recruitment, we need YOUth! Halloween? Yes. Candy? Yes. Mentoring Day? ABSOLUTELY! Want to talk DIRECTLY to your Legislators & Senators? Interested in Conferences and Events but don't necessarily have the funds? Check this out! What Works & What Doesnt Work? Let them know now! SAY WHAT?! New Bill of Rights for Travelers with Disabilities! New Support Law for Caregivers! $5 Million Dollars for Addiction Treatment Staff! A Message from Our New Team Member! "My name is Ashley Rivera, I am a 25 year old NYC native and am dedicated to being a light in the lives of everyone I encounter. I tell people I was born to be a voice for change and empower others to advocate and embrace themselves. I have advocated and navigated through the NYC Foster care system; which is very difficult when you're one in a million children who have needs. I wrote for Represent Magazine in High School, which is a Magazine run by Youth in Care used as an outlet to educate others on our struggles. I then delved into Juvenile Justice and began advocating for more Alternative to Detention programs to be created for NYC youth. I graduated High School which was a milestone, since I was the first person in my family to do so. I attended SUNY Plattsburgh and knew I wanted to major in Political Science and Latin American Studies. I knew that change came through various forms, but policy was a large part of what affects the lives of everyone. While in college I participated in advocacy day, where we spoke to representatives in Albany to advocate for more funding for Educational Opportunity Programs. When I graduated I was unsure of what I wanted. I found myself like many millennials, jobless. I moved to Buffalo and started working as a Teacher's Assistant for a Special Education school who served youth who were expelled from their district schools. I was exposed to a new population, youth who were deemed disposable. I was unsure of how that experience would guide me to the right profession, but it did. Everything I have been through, every job, every encounter has led me to right here. Engaging youth and helping them advocate for themselves. I do not want to do anything else than this. It is so important that all youth find their voice, gain confidence and are guiding their lives. I am excited to work with YOUTH POWER! and be on this wonderful grant." -Ashley Rivera, Youth Wraparound Implementation Coordinator, YOUTH POWER! Visit our website to learn more about YOUTH POWER! employees! VOYA Engagement Coordinator Position Open! YOUTH POWER! is looking for applicants for the VOYA (Voices of Youth Advisors) Engagement Coordinator. VOYA (Voices of Youth Advisors) is a youth advisory council to Rensselaer County. VOYA is charged with bringing the perspective of young people who receive cross-system services to the work of Rensselaer County. VOYA ensures meaningful two-way communication and collaboration between the county and young people who receive services. STATUS: Hourly, Part-Time, 10-12 Hours per week, $15-18 per hour commensurate on experience. Must have personal life experience in child serving systems such as: behavioral/mental health, disability, child welfare, addiction recovery, and/or juvenile justice. 1 year experience with youth and family-serving systems and/or non-profit organizations. Strong team leadership and collaboration abilities. Excellent written, documentation, and computer skills. APPLICATION PROCESS: Applicants must send a resume with a formal cover letter in order to be considered. The letter should indicate the title of the position that the applicant is seeking. Share Your Voice Statewide with Our Newsletter! Time to claim that Our Time is Now! Share your voice across the state in this year's for member, by member Annual Newsletter! What can you submit? Poetry, short stories, graphic art, inspirational quotes, signs & posters, essays, whatever your creative mind thinks of! As a young person, how have you been empowered or informed to realize you truly can make a difference? Did you go to an event or a workshop that inspired you? If so, which one and how? How have you and your peers advocated for change this year? Submissions are due by: Monday, November 26th, 2018. APPLICATIONS ARE LIVE for the AMPLIFY-NY NYC Youth Leadership Forum! LAST CHANCE TO REGISTER NOW & ATTEND! YOUTH POWER! 's AMPLIFY-NY Initiative will host the 2018 New York City Region Youth Leadership Forum (YLF) for young people with disabilities to speak up, build skills, and prepare to take on leadership roles. This peer-run forum brings opportunities to YOU th and gives the next generation of leaders the tools and support they need for success. The YLF is a safe, youth-friendly environment with plenty of fun activities to complement the wealth of knowledge being learned! This 4-day, 3-night forum is FREE to attend and includes panel presentations, hands-on activities to practice leadership skills, and supported leadership activities. Future leaders do not want to miss this opportunity to build leadership skills and become empowered with self-confidence and self-determination! YP! 's Elijah Fagan-Solis speaks at Cortland County Mentoring Day! While October is often thought of for the beginning of the NBA season, the World Series, and of course scary movies, delicious candies and Halloween, to millions of others October is National Disability Employment Awareness Month (NDEAM). NDEAM is a national campaign held each October which celebrates the contributions of workers with disabilities and educates about the value of a workforce inclusive of their skills and talents. Once again this year, Access to Independence of Cortland County (ATI) celebrated NDEAM on the third Wednesday in October which also happens to be Disability Mentoring Day, which is a national effort to promote career development for students and job-seekers with disabilities through hands-on career exploration and ongoing mentoring relationships. This year, they invited YOUTH POWER! 's Statewide Emerging Leadership Manager Elijah Fagan-Solis to celebrate with them. 2018's Cortland County's Mentoring Day began with a delicious breakfast for over 30 young people from numerous schools across the County. Elijah was asked to be the motivational speaker for the day; He shared a personal story of his kidneys failing and how he dealt with mental health challenges, bullying, and wanting to give up throughout his teenage years. He highlighted the importance of how having career dreams and other goals motivated him to not give up, how caring traditional and peer mentors spoke life into him and helped him realize he was capable of more than he thought, as well as encouraging the youth to run their own race at their own pace and not to focus on others journeys because they are not the same. The day concluded with all participating youth traveling to various job sites to tour the facilities and speak with individuals working in their field of interest. Elijah was able to assist in mentoring two youth who were interested in being nurses. They toured Cortland Regional Medical Center where they were able to speak with numerous friendly staff who shared about their experiences working within the ER, the nursing/rehabilitation unit, the ICU, the lab and more. The youth even had the opportunity to enter into an operating room, as well as were offered per diem nursing work over the summer when they are of age. YOUTH POWER! is grateful to have had the opportunity to be part of such a well-organized and wonderfully inspiring event. A special thank you to ATI Cortland for extending the invitation and for doing all that you do to provide opportunities to youth in Cortland. Mark Your Calendars for Family Empowerment Day! If so, join us in Albany and make your voice heard! To learn more, contact Brad Hansen at bhansen@ftnys.org or call 518.432.0333 x 28. Registration coming soon. 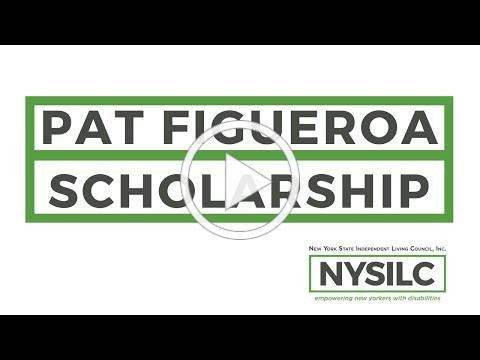 Since 2012, the New York State Independent Living Council, Inc. (NYSILC) has actively supported leadership opportunities for young adults with disabilities through the Patricio "Pat" Figueroa Scholarship. This scholarship awards young adults (ages 18-28) up to $250 to attend conference, training seminars, and other events to enhance their leadership abilities. The funding is aimed to help defray the cost of travel, food, and other out of pocket expenses. The council makes decisions on a first-come, first-served basis, while attempting to maximize resources. Decisions also stem from a cost and need basis of the applicant. Completion of a follow up survey summarizing their experience. Click here to apply! Ap plication Form. If you have any questions, please contact Brad Williams at bradw@nysilc.org or (518) 427-1060. Organizations are Hearing from YOU! CSSP was proud to announce the launch of the Youth Thrive ™ Survey on October 30, 2018. This instrument, the first of its kind, based on positive constructs is a valid web-based survey that measures the presence, strength, and growth of the Youth Thrive™ Protective and Promotive Factors as first hand indicators of well-being. This survey will help organizations reach more youth in more meaningful ways, organizations will collect data directly from YOU! This survey is co-designed with youth and young adults. The survey can be an effective tool for informing case planning and practice, evaluation, and continuous quality improvement (CQI) purposes. The Youth Thrive ™ Survey provides reports and a full array of data visualization options from YOU, to the organizations! All youth and young adults deserve to be supported in ways that advance their healthy development and well-being. One of the best ways to support young people is to ask them directly about how they are doing. The linked one-pager includes additional information about the survey, its multiple uses, and more information on the Protective and Promotive Factors. OMH Statewide Virtual Town Hall Registration now open! Commissioner Ann Sullivan, M.D. , presenting and taking feedback on several key priorities under the new OMH Strategic Plan. This event will provide the public an opportunity to learn more about the OMH vision for the future, including progress on the Commissioner's top policy and planning priorities presented at last year's Town Hall . OMH is dedicated to providing individuals and families access to quality, integrated services and supports that foster recovery and well-being; public input is crucial in assisting the agency in meeting the needs of all people we serve. All comments will be reviewed and considered in the development of the annual OMH Statewide Comprehensive Plan pursuant to Section 5.07 of the New York State Mental Hygiene Law. The town hall will be held online via WebEx in order to maximize access for public participation, with limited in-person seating available in Albany for attendees who are unable to access the event online. Comments and questions can be presented both online and in-person for those attending at the OMH Central Office. If you require any special accommodations to participate or have any questions, please contact Ben Rosen at 518-474-1897. New law for Travelers with Disabilities! A bill of rights for airline passengers with disabilities and enhanced disability training for Transportation Security Administration officers, among other changes, are on the way under a new federal law. President Donald Trump signed legislation late last week to reauthorize funding for the Federal Aviation Administration for five years. Contained within that package are an increase in civil penalties for bodily harm to passengers with disabilities or damage to wheelchairs and mobility aids, creation of an advisory committee to recommend consumer protection improvements and the development of an "Airline Passengers with Disabilities Bill of Rights." "I think it's a very good message to the Department of Transportation and the airline industry that Congress is very concerned about air travel for passengers with disabilities," said Heather Ansley, associate executive director of government relations for Paralyzed Veterans of America. "We have a lot of good opportunities in here to reconsider regulations, get out education and get the department to have regular conversations about passengers with disabilities." Disability rights advocates say that air travel can be extremely unpleasant for people with disabilities whether it's the lack of a wheelchair accessible restroom on board or the sensory overload of going through a crowded security line. While airports are subject to the Americans with Disabilities Act, air travel is governed by the often less familiar Air Carrier Access Act. The to-be-developed bill of rights requires that "plain language" be used to spell out the rights of passengers with disabilities, including receiving timely assistance and seating accommodations if requested. The law says airline employees and contractors must undergo training on the bill of rights. The legislation also requires the TSA to revise its training for screening passengers with disabilities in the next six months. The agency must address proper screening and any particular sensitivities a traveler with a disability might have, including to touch, pressure and sound. Signs must be posted at security checkpoints advising on how to complain of screening mistreatment based on disability. What's more, the law requires studies of airport accessibility best practices and the feasibility of someday allowing in-cabin wheelchair restraint systems so that people could remain in their wheelchairs in flight rather than having to transfer to an airplane seat. "That's something that a lot of people who use wheelchairs would like to see," said Ansley with Paralyzed Veterans of America. "That's certainly how you travel on a train or bus or any other mode of transportation." Learn about EVV and Take Action Against It! New EVV Advocacy Document and Opportunities to Take Action! Since its creation earlier this year, NCIL's Electronic Visit Verification (EVV) Task Force has closely followed federal and state activity and has been hard at work strategizing and advocating against EVV. EVV stands for Electronic Visit Verification. Essentially, it is a technology that verifies where and when a caregiver begins services for a client and when they clock-out. This provides a breadcrumb trail that provides the basis for billing. EVV is harmful and discriminatory, and it undermines consumer direction - a key tenet of the Independent Living Movement! In addition, it is an absolute violation of our privacy and has a chilling effect on workers continuing or entering the labor force of personal care services providers. All of these issues combined will result in putting our right to live independently in the community in severe jeopardy. The NCIL EVV Task Force has created the following Principles & Goals document to guide NCIL's work, and we hope our members will be able to use this to guide their advocacy on the issue as well. Please feel free to use this document (as a whole or in pieces) as you see fit in your advocacy. Please also share this document with your networks and encourage everyone you know to learn more about why EVV is so harmful to people with disabilities! Provide input to CMS during an Open Door Forum! The Centers for Medicare and Medicaid Services (CMS) will host an Open Door Forum to hear from you! When: November 7 from 1:00-3:00 p.m. Comment from the public was submitted & compiled for the CMS Forum. These comments will be reviewed to support the Independent Living Community and to those with disabilities! The Leadership Development and Civic Engagement Program (LDCEP) is a project of the New York State Independent Living Council, Inc. (NYSILC). NYSILC is a non-profit, Federally-mandated state council whose primary purpose is to jointly develop, monitor and evaluate the 3-year Statewide Plan for Independent Living (SPIL). For more information about the council, visit the NYSILC website at www.nysilc.org . Any questions about the LDCEP: info@LDCEP.org . Questions about the council: bradw@nysilc.org . NYSILC office: (518) 427-1060 (voice of TTY). President Donald Trump signed legislation this week known as the Recognize, Assist, Include, Support and Engage, or RAISE Family Caregivers Act. The law calls for the secretary of health and human services to establish a national plan to "recognize and support family caregivers" within 18 months. The plan is supposed to include recommendations for federal, state and local governments as well as health care and long-term services and supports providers. The strategy is to be updated every other year. Additionally, the legislation also creates a Family Caregiving Advisory Council comprised of federal officials and stakeholders in the community to guide the strategy's development and advise the secretary and other members of government on how to support the more than 40 million family caregivers across the country. "Most people with intellectual and developmental disabilities in our nation live with family caregivers, and nearly 900,000 of these family caregivers are over the age of 60. For many individuals with I/DD, their caregivers mean a life in the community with their family and friends," said Peter Berns, CEO of The Arc. "Each vote for this bill was a vote to support caregivers so that they can continue in their critical roles in supporting their loved ones." Visit the article website here! Funding for Personnel to Assist those Seeking Addiction Treatment! GOVERNOR CUOMO ANNOUNCES $5 MILLION AVAILABLE TO RECRUIT VITAL PERSONNEL NEEDED TO ASSIST NEW YORKERS SEEKING ADDICTION TREATMENT SERVICES! Funding will help OASAS Certified Outpatient and Opioid Treatment Providers secure approximately 120 Nurse Practitioners and 50 Certified Peer Recovery Advocates! Certified Peer Recovery Advocates are individuals who hold an OASAS approved certification and provide peer support services. The advocates are either in recovery themselves, or have a close family member in recovery, and work to help patients develop recovery plans and learn effective coping habits. Nurse practitioners treat patients attempting to break their addiction to drugs, alcohol or other addictive substances. They may diagnose, treat, and prescribe for a patient's condition that falls within their specialty area of practice. Within OASAS settings, their responsibilities may include: acute care; adult health; family health; psychiatry; and women's health. The funding will be made available through a Request for Applications administered by OASAS on October 17, 2018. Applications will be accepted through November 7, 2018. Interested parties can review the Request for Applications.